A team of physicists has used knot theory – a branch of abstract mathematics – to create holograms where light can flow in whirls and eddies, forming lines in space called optical vortices. This new research, published in Nature Physics, demonstrates a physical application for a branch of mathematics previously considered completely abstract. The researchers, from the universities of Bristol, Glasgow and Southampton, UK, say that understanding how to control light in this way has important implications for laser technology used in wide a range of industries. “In a light beam, the flow of light through space is similar to water flowing in a river. Although it often flows in a straight line – out of a torch, laser pointer, etc – light can also flow in whirls and eddies, forming lines in space called ‘optical vortices.’ Along these lines, or optical vortices, the intensity of the light is zero (black). The light all around us is filled with these dark lines, even though we can’t see them,” explained Dr Mark Dennis from the University of Bristol. Optical vortices can be created with holograms which direct the flow of light. 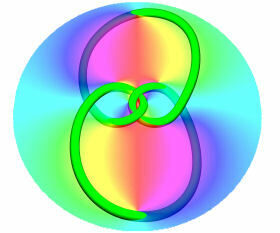 In this work, the team designed holograms using knot theory. Using these specially designed holograms they were able to create knots in optical vortices. “The sophisticated hologram design required for the experimental demonstration of the knotted light shows advanced optical control, which undoubtedly can be used in future laser devices,” noted co-researcher Professor Miles Padgett, from Glasgow University.